Please refer to our stock # R229 when inquiring. 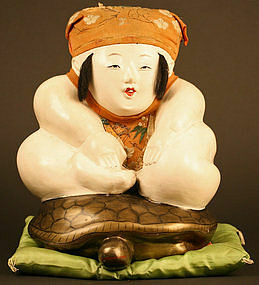 A wonderful large Edo Period Gosho Ningyo of Urashimataro. A delightful, playful rendering of this timeless theme. These type of Palace Dolls are usually smaller. This charming example is a unique, wonderful form from all angles. He is wearing an embroidered cap and bib and has a highly burnished finished gofun pigment. 12h x 11w inches, 30.h x 28w cm. Excellent Condition.